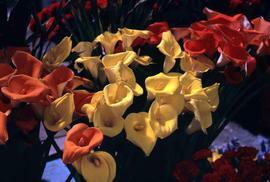 Colour Kodachrome 35mm slide depicts colourful calla lilies and other flowers. 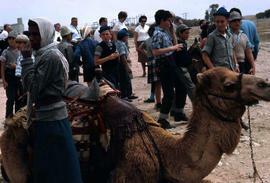 Colour Kodachrome 35mm slide depicts a camel with people in the background, possibly in Beersheba. Photograph depicts a group of people and an unidentified man at a podium. Photograph depicts a group of people seated at the speaker's table, with one man standing and speaking.